What about frugal decorating tips? I don’t own any decorations and I don’t plan on buying any, but I’d still love my house to look Christmasy! I am certainly not the world authority on Christmas decorating, and I have a remarkable dearth of un-purchased decorations. I’m also something of a minimalist, so I like to keep my decorations simple and somewhat sparse. But in case you are still interested, here’s a little peek at my decorations, 99.99% of which have been purchased here and there during post-Christmas sales. This snowglobe is one of two from an Eddie Bauer after-Christmas sale. There used to be three, but one of them (my favorite, of course!) fell to its demise years back when Joshua was small and was touching things he wasn’t supposed to be touching. Ahem. I got this snowglobe on clearance at Target after Christmas. 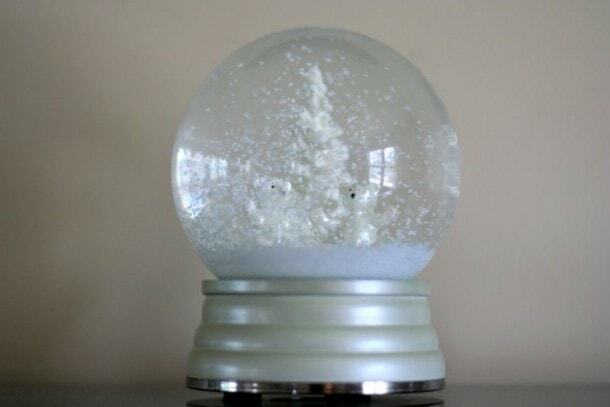 I love how much snow is inside of it, as so many snowglobes have just a few flakes. 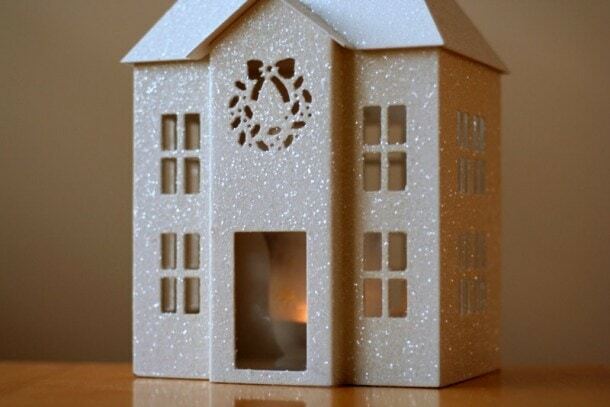 My sparkly candle house came from an after-Christmas sale at Bath and Body works. It was filled with soap and bath stuff in my favorite scent (Moonlight Path), and though I’m not certain that the house is supposed to be a candle-holder, I think it works very well that way. 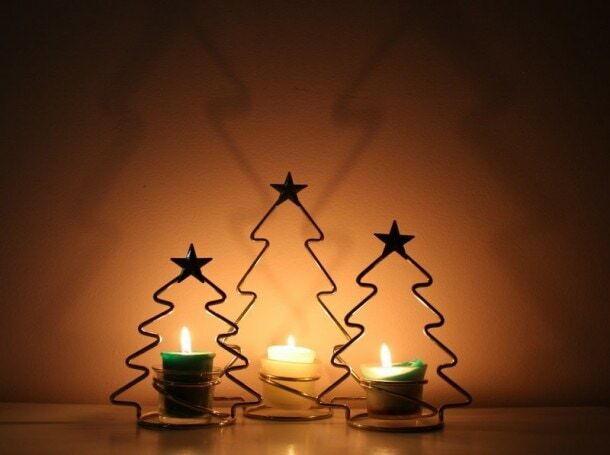 I own two sets of these Christmas tree candleholders from Hallmark. The first set was a gift from my sister and the second one is from (you guessed it!) an after-Christmas clearance sale. Though our Christmas tree is covered with a wide variety of ornaments from various sources, the main theme is blue and silver. Our fuzzy/sparkly blue ornaments were purchased at full-price, before Christmas (shocking, I know). Most of the silver balls and all of the small blue and silver balls were purchased on clearances after Christmas, though (from Kohl’s and Lowe’s). The lights were purchased on clearance in January as well. 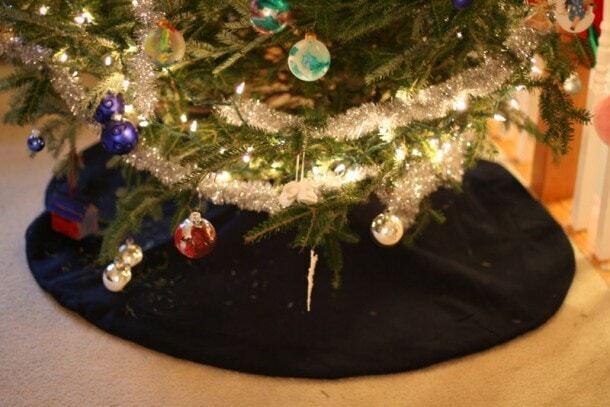 For many, many years I had no tree skirt and made do with a white sheet. Every year, though, I faithfully poked through the clearances after Christmas, never able to come up with a tree skirt that would go with our blue theme. A couple of years ago, though, I found this simple dark blue tree skirt on clearance after Christmas, and I snapped it up. These are our stockings, which, to the best of my memory, were not purchased on clearance. We’ve never had a mantle in any of our homes, so I’ve always had to find other ways of hanging them. This year I used some ribbon (purchased on clearance after Christmas). The ribbon is just pinned right now, but next year I was thinking of sewing some velcro onto the ribbons to make a neat closure. 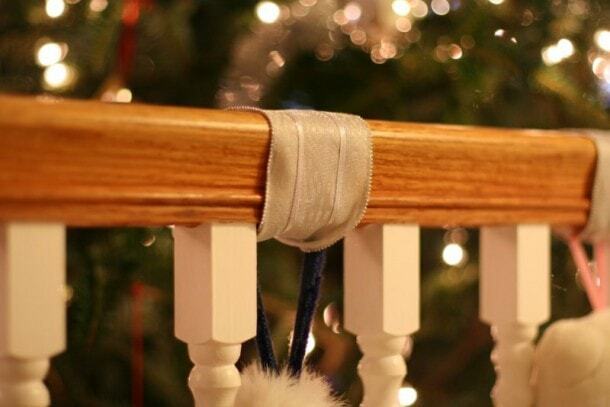 Wire holds the stockings up, so the ribbon is just for looks, and the velcro would have sufficient holding power. So, there you go…a small tour of my Christmas decorations. There’s more than this (I have a front-door wreath that I bought for a few dollars after Christmas one year, I have more candleholders, and we have some outside decorations as well), but this post is getting kind of picture-laden as it is. Hopefully, though, it may inspire you to pick through the after-Christmas carnage at a store near you (or through the never-ending supply of Christmas stuff at Goodwill!) to find a few treasures to use next Christmas. How do you decorate without spending a bundle? I live near Colonial Williamsburg & they do lot of their decorating w/ natural objects. If you Google Colonial Williamsburg Christmas lots of photos, ideas, & their podcast will come up. My suggestion would be this – if your family are gift givers, let them know you’d like decorations for your home. The first year we married my in-laws began giving me a very nice nativity, and continued over the course of several years. First was Jesus, Mary & Joseph, then the shepherds, then the angel, etc. I bought the stable at a 50% off after Christmas sale. When we moved into our first home, I mentioned to my sister that I would like to have decorations for the house. So for several years that is what she focused on. It worked for us! I love your tree, it’s stunning. and we got to target to get snowglobes for my four kids every year on clearance. it’s the only way to shop. 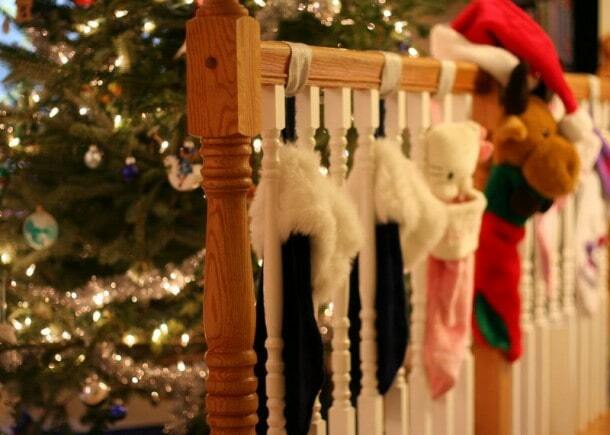 Just visiting from the Nester’s party – love the idea for hanging stockings! We don’t have a fireplace (or a banister either for that matter! ), so I’ve always had to find other ways/places to hang our stockings. Your house looks wonderfully welcoming and I love that you have gotten everything on sale! I also like Sharon’s idea for asking for decorations as gifts – would never have thought of that! Merry Christmas! What beautiful decorations. 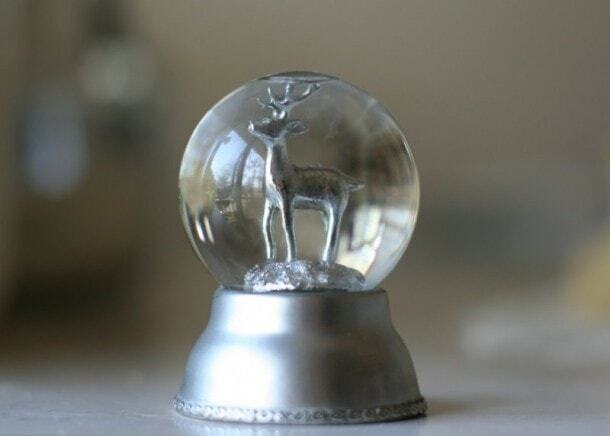 I especially love the simple snow globes. To slowly grow our collection of ornaments, my husband and I exchange one ornament each year (in our stockings). We also try to pick up an ornament while on vacation because they are sweet little souvenirs that remind us of fun times each year we hang them on the tree. I’ve also made quite a few myself and (like you) check out after-Christmas sales. We have crochet stockings that my grandmother made for us with our names on them. I like the homemade look personally. Our house was built in 1860 and we have been under construction for the past 5 years. This year is our first Christmas in the house with our 2 little girls. We also don’t have a mantel so I took an old peice of the original barn siding from the house and some of the old carpenter nails for a rustic look. I hung our hand made stockings from it and it is also something I can keep up year-round. As for frugal present ideas. I took one of the old windows from the house and painted it and made a picture collage in the panes of my nephew for my sister. Cost me about $12 and it looks GREAT! I have 3 collections (Nutcrackers, Angels, and Rocking Horses) that I’ve picked up over the years at Goodwill and garage sales. The best way to think about decorating is that it’s not an All At Once proposition, but something that evolves over the years, bit by bit. For several years, all the nieces and nephews in my husband’s family drew names and then exchanged ornaments among each other rather than toys. Now my kids love to look at their ornaments. We hang them all on our tree, going for an eclectic and memory-filled look. 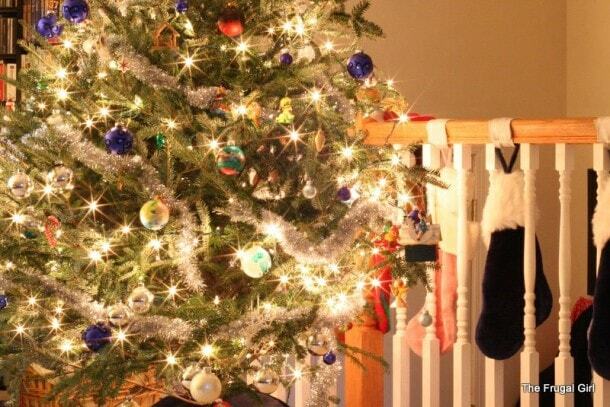 Our kids enjoy playing I Spy with the ornaments on the tree! Beautiful decorating, Kristen! We, too, have taken the ‘let’s go at it slowly’ approach to acquiring decorations. Some purchased on sale or clearance, others (rarely) at full price. Lots of them are homemade (stockings and the tree skirt, for example). One thing I want to begin doing is giving Christmas decorations for bridal shower and wedding gifts. That “First Christmas” can be such a surprise (“What?! I have to buy decorations? Where do I go?” etc) and this would be a way to get the new family started. Get some green ribbon and “draw” a tree on a blank wall. Follow with a few white lights to help with the sparkly factor. Alternatively, buy a large-ish terracotta pot, spray pain silver, and stick silve-spray-painted branches (found on the side of the road or in your yard) in it, then drape with lights. Spray-painted things from nature work great, especially pinecones, small branches, and sprigs of berries. If you don’t have pets, try making a popcorn string – thread popped popcorn on a thin piece of string or thread using a darning or yarn needle. Card ornaments – Buy a bunch of sparkly cards (there are packs of 8 for sale at Michael’s for $1 each), cut out the fronts, punch a hole, and thread with twine. Take any clear glass vessels you have (wine glasses, vases, regular cups, etc.) group in mixed groupings, and fill glasses with festives things – cookie cutters, pine cones, sparkly ribbon, sparkly card bits from your ornament project, etc., then tie a piece of twine near the top of the glass to finish it off. Buy cheap frames (dollar store, Ikea, etc. ), or use ones you already have, and frame cutouts of Christmas paper wrapping. Bend a wire coat hanger into a circle (you’ll need two pairs of pliers for this project). Tie festive items to the coat hanger – see recommendations for ornaments, and finish off with a simple ribbon bow in your favorite color. You can also double up the coat hangers (an inside and outside circle) and wrap with cut and curled strips of Christmas paper. It is easy and inexpensive to make your own ornaments using a flour based “clay.” Most recipes call for flour, salt, and water. Mix it together and roll it to between a quarter and a half inch thick. Use cookie cutters or anything else you might have to make shapes. They can also be “written” on using a toothpick. Bake it or let it air dry. It can then be painted or left white. I have a niece and a nephew who will be celebrating their first Christmas this year. I am going to make the children’s handprints into ornaments for both of my sisters. Just make a half inch thick circle (I use a large oats container or bowl to make it round) and then press the child’s hand or foot gently against it. My strategy is slow and late. And little white lights are a must. Slow: Rather than a lot of cheap anonymous decorations I’m slowly collecting ones that are personal or have some signficance. My main source is places I’ve gone to (but ran out of time at Williamsburg over Thanksgiving, drat it). Late: shop the post-Xmas sales for things I like for next year. Since losing everything in the flood of Hurricane Katrina, I have had to recreate all my handmade decorations and tree trimmings. Anything I have bought is from thrift stores…some vintage ornaments in the mix! Our small apartment is cozy and festive without costing much at all. And I adore your snow globes! Liz, my family used to do the popcorn thing when I was a kid! Loved that. William, I adore little white lights too. I think they are so classy looking. Theresa, I love that bridal shower idea. My other favorite idea is to give a basket full of spices (assuming the bridge and groom don’t have well-established kitchens already) because it’s hard to cook without a nice array of spices. I always purchase decorations after Christmas when they are drastically marked down and use them the following Christmas. And it’s great – I’m always surprised by what I purchased the previous year(I don’t have the best memory). When we first had a tree I made a lot of ornaments. Many of them have held up nicely over the years and are still used if we use the big tree, which doesn’t happen often. Salt dough, thread-crocheted snowflakes (a favorite), little gingham ornaments in seasonal shapes like boots, stars, trees. Our daughters nearly always brought home ornaments they made in school every year and these are very precious. One funny one is a green snowman our younger daughter painted at a December birthday party when she was about 3. (Hey, she chose a snowman and wanted to paint it “� green’s good, isn’t it?) White lights, some glass ornaments for sparkle, etc. we didn’t make but they have held up over the years, too. It’s not as if you have to buy everything new each year for a whole new look. In fact, most families enjoy their very own traditional trees ever year, whatever they are decorated with. My aunt jus came by and dropped off all her christmas decorations, four big boxes. She is selling her house and downsizing. YAY! I am set! Your snow globes are so pretty! I love them! Kristen!! Your Christmas Deco is very classy! ! ! I love the theme! ! I outsource my Christmas decorations. That is, I don’t put up any at all. My girlfriend (hopefully soon to be fiance) and I both have some ornaments and stuff we were given as children and when we build a home together we can use those. As for right now, I just kind of enjoy what I have. I was thinking of making a print of one of my favorite slides I shot and hanging that up for Christmas but I never got around to it. I managed to be at Hobby Lobby on their day for 50% off Christmas deco items, and bought one large roll of red ribbon, of the wired variety–4 bucks for 90 feet. 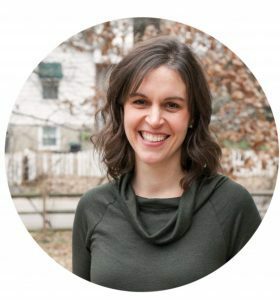 I’ve used it all over my house–in my windows to hang a single colored christmas bulb–if I had more gumption I probably would have done groups of 3 or 5 in varying lengths. I used a bit on all my lamps to tie bows with long tails. I also used some, in a big bow with two long curling tails, on the wall where I display all of our Christmas cards. I still have ribbon left, which I’ve used to tie all of the teacher gifts with. I’ll probably reuse it all next year, either on gifts or to decorate! Seriously, the best four bucks I’ve ever spent on Christmas stuff! I love Amber’s idea: making ornaments out of salt dough! I’m sure your ornaments will be a big hit and I am dismayed I didn’t do that for my children. Apart from our family pictures, my most prized possessions are all the drawings and crafts my children made while growing up. They are 23 and 19 and we have their hand-made ornaments up on the tree. Our Chistmas tree ornaments are gold and red, with lots of white lights. We decided on having a theme, and I really recommend it for people just beginning their ornament collection. I bought a bunch of Martha Stewart Christmas decorations (blue and silver) a few years ago on clearance. I believe they were like 85% off so they were really cheap. I do love a good clearance sale. I haven’t actually used them yet though. We’ve gone home for xmas every year since I bought them. I see no sense in decorating if I’m not even going to be here. I like to cut vases of holly, boxwood, & hemlock greens from my garden. When we first bought our home, I would hit seasonal local crafts fairs for inexpensive, creative ornaments. I’m at the stage where I don’t really need to buy anything, and I go for a really minimalist holiday decorating approach. I’ve given a lot of my early stuff away to younger folks who are still in the acquisition stage.